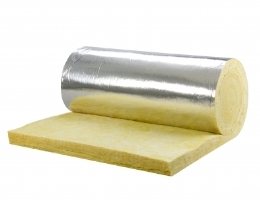 Thermal Insulation reduces thermal conduction to lower building heat losses. It plays an important role in energy reduction. UK U-value History: Download a guide to the changes to fabric U-values in the UK. If the u-value for a roof is 0.16W/(m2K), then 275mm thickness of mineral wool is required as calculated by: Mineral Wool thickness = 1/0.16 x 0.044 x 1000 = 275mm. Note that this is only a quick calculation to assess the approximate insulation thickness and ignores other layers. Thermal conductivity (k or lambda value - W/mK) is the capacity of a material to conduct heat, or in the case of an insulating material the capacity to resist heat transfer. It is considered that materials are thermal insulants if their conductivity is less than 0.065 W/mK. Thermal resistance (R value - m2K/W) is the capacity of a product to resist against heat loss. A product with a higher R value will perform better as an insulator. The thermal resistance of a specific product can be found by dividing its thickness by the thermal conductivity or if the R value is given, then the thermal conductivity can be calculated by dividing the thickness by the R value. Remember to work in metres not millimetres.